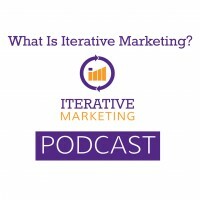 Iterative Marketing Podcast: What Is Iterative Marketing? Iterative Marketing came from frustration with “big campaign” thinking. It is a compilation of best practices within marketing, just in a package and with a name. The methodology is based on six fundamental truths (level-setting beliefs/understandings of marketing) and six actionable components (the actions you take to apply Iterative Marketing). Persona-First: Marketing is most impactful when every idea is approached from a persona-first mindset. Programs (Not Campaigns): Programs produce the best ROI when they are indefinite (not time-boxed), continuous and repeatable. Measurement & Feedback: By making measurement and feedback part of the planning process, we ensure we have the data needed to make business decisions and allow for continuous improvement. Minimum Viable Marketing Program (MVMP): Beginning with a minimum viable marketing program maximizes opportunity to apply insights as a program grows, minimizing investment in unsuccessful ideas. Data-Driven Decisions: The best decisions are based on data, rather than bias or sunk cost. Create Insight: Experimentation is most valuable when it not only leads to improvement in program results, but also drives insights into our personas. Brand Discovery: Uncover how your buying audience feels about your product or service and how they rationalize the decision to buy. Persona Discovery: Document the individuals involved in the buying process in a way that allows us to empathize with them in a consistent way. Journey Mapping: Plot the stages and paths of the persona lifecycle, documenting each persona’s unique state of mind, needs and concerns at each stage. Channel and Content Alignment: Align every piece of content and marketing channel/activity to a primary persona and primary marketing stage, identifying new channels and content needs where opportunities exist. Experimentation and Optimization: Conduct thoughtful experiments designed to produce statistically significant business insights and apply the results to optimize performance. Reporting and Feedback: Report and review data and insights to drive decisions in content and strategy, as well as information to be used by the organization as a whole.